I believed in Santa until I was 15, and I don’t regret it one bit. In fact, while some kids on my bus may have ruined who gave me presents, I still believe in the spirit of Santa. A spirit of giving and of thinking about others before ourselves. The thought that every good little boy and girl gets toys. To Santa, it didn’t matter if you were rich, poor, black or white. Santa cared about your heart. Were you naughty or nice this year? 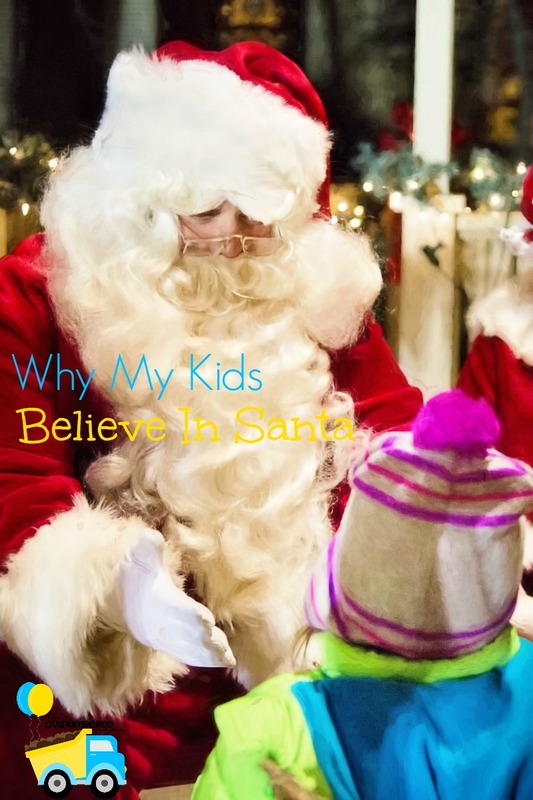 More and more I’ve been seeing parents share how they will not lie to their kids about Santa. My kids? They are definitely excited for old Saint Nick to swing by our house Christmas Eve, and hopefully they will be for many years to come. I touched on this a bit earlier, but I feel like Christmas time is a time for giving. Santa is all about giving gifts to those who deserve it. We give gifts at Christmas time whether that’s a craft for grandma or baking cookies for the firefighters. We also donate toys during Christmas time because not all children get as many gifts on Christmas. In a society where so many kids grow up with an attitude of expecting whatever they desire, I want to raise kids who choose to give to those who need something without expectation in return. That’s what Santa does. I grew up in a very Santa-centered home. We had a nativity set, but the overwhelming majority of our decorations and holiday festivities were focused on Santa. Our home is a lot more Christ-centered than my parents’ home was, but we still have room to believe in Santa. I know that the true spirit of Christmas is God’s grace and our salvation. We teach that to our children by having a birthday cake for Jesus and reading the true Christmas stories. That being said, it’s a pretty difficult concept for a preschooler. It is an intangible gift, one in the spirit. You can’t see it or touch it. With Santa, you must believe without seeing or “proof”, and he gives you a gift that’s tangible. This isn’t to replace the truth of Christmas, but to help prepare for it. It’s no secret that I’m a huge Christmas fan. Chris has had to put forth some rules, or we’d decorate for Christmas in October. But the second we’re done with Thanksgiving? Christmas music is on, our tree goes up, and we are in full Christmas mode! We love to go to our local tree lighting, where Santa comes on a firetruck and takes pictures with the kids. There’s a log cabin in my hometown that Santa visits on the weekends in December where you can get pictures with him and tell him what you’d like for Christmas. We even have Santa come to Cookie Day to inspect the cookies that the kids are decorating for him. Santa is fun, and these activities aren’t nearly as fun if you don’t believe in Santa. He’s a huge part of the Christmas holiday, and I want my kids to be able to enjoy that magic while they’re young. So what about you? Do you include Santa into your Christmas fun, or is he off-limits in your house? If you don’t participate in Santa, do you teach your kids to not tell others? I’m curious how that works! Aww what a sweet post. And great thoughts. I’m not huge on the Santa thing in our house, but I do like reading others opinions on it. I am the same way! We love Santa here, but I’m always really curious about why other families choose differently. I didn’t have a clue that any families skipped Santa until last year! My father still teases me because I believed in Santa until I was at least 12! lol! I’m glad I’m not the only one. We do Santa at our house too – it was so exciting to wait not-so-patiently for his “visit” that I want my daughter to have that anticipation too! Yes! Waiting for Santa was totally the best part. My parents loved that I believed in Santa.. Except when I was 14 and still so excited that I woke everyone up at 4 am.. That wasn’t as cute! hahaha. Now I have fun waiting for my kids to wake up! Thanks for stopping by!